This type of attachment is a point in space and a rotation, which is transformed by parent bones. It can be used to spawn particles or do anything else that involves a position and/or rotation. Point attachments have one advantage over bones: a point attachment can go in a skin, so the position and rotation can change for different skins. For example, different guns may shoot from different positions. 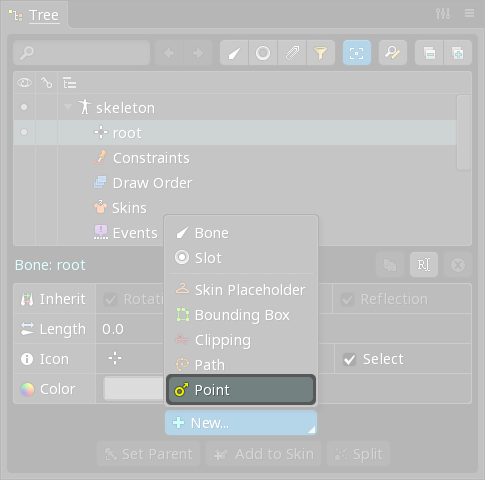 To create a new point attachment, select a bone or slot in the tree, then choose New... Point in the properties at the bottom of the tree. A point attachment has two properties shown at the bottom of the tree. It is possible to have multiple point attachments under the same slot. When Select is unchecked for a point attachment in the properties at the bottom of the tree, the point attachment can no longer be selected and won't be exported. When it is no longer needed, the attachment can be deleted or hidden by clicking the visibility dot in the tree. The color is used to tint the point attachment. This has the same function of changing the color of a bone, which is to differentiate the different point attachments inside the editor, especially when many point attachments are in a small area. Like all attachments, it is possible to set different point attachments in different skins by placing them inside skin placeholders. Like regions, the point attachment position cannot be keyed during animations.